Click to enlarge Its a blazing hot Summer afternoon and you've decided to go botanizing. Hiking up one of the steepest, rockiest slopes that you've ever ventured upon, your parched throat feeling like sandpaper, you reach for your canteen and...Oh no, its empty. Geez, you're two hours up the mountain, past the point of no return. Watcha gonna do, who ya gonna call. How bout Ginger??? No, I don't mean the Ginger that you buy at the supermarket, the one that they make ginger ale from or that you use in your stir-fry. 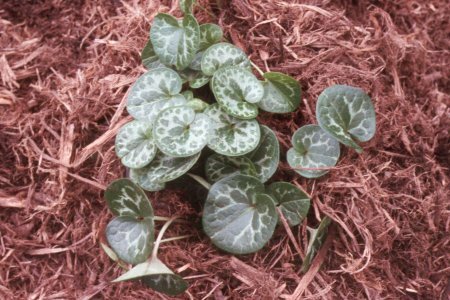 I'm talking about Asarum or Hexastylis-our wild Gingers. Long known and used by Native Americans for it's stimulant effect, members of these genera have a pungent aroma when you snap their firm roots that's reminiscent of the tropical Ginger. In fact you can easily substitute it for the culinary ginger in your favorite Thai or Chinese recipe. Wild Gingers are members of Artistolochiacea or the Birthwort family. This is a very small family of five genera, most of the species being of tropical origin. The common name of the family seems to be derived from two Greek words, Aristos, meaning best and Lochia, meaning delivery. This name pertains to the Genus Aristolochia which is supposed to be of value as a medicinal herb in childbirth. 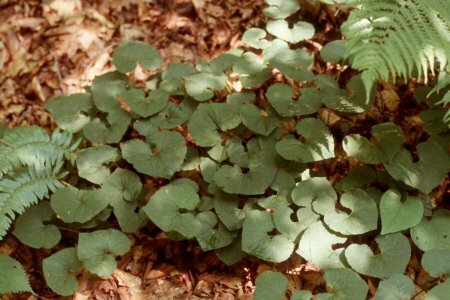 In West Virginia, we have five species of Wild Ginger. According to C. Ritchie Bell, author of the Flora of the Carolinas, only the deciduous species are still in the genus Asarum, the evergreen types are now placed in the genus Hexastylis. Asarum canadense is most common in moist rich woods in light to dense shade. I have seen leaves as big as your head under favorable conditions. You have to get down on your hands and knees to see the curious, pendulous flowers which hang down under the foliage. The flowers are pollinated by ants and other small insects that crawl into the flowers and move the pollen from the open pollen sacs on the anthers to the sticky receptive stigmas. Hexastylis virginica is the only evergreen type that I've found in West Virginia. It seems to favor the higher elevations of Greenbrier County on mainly Northern facing slopes. According to Flora of West Virginia, it occurs in 16 of our 55 counties. You can tell it by the glossy, round to cordate (heart shaped ) leaves 4-6cm (1-1.5" ) wide. The plant is very prostrate reaching from 8-24cm (2-6") in height. The foliage is silvery mottled and like snowflakes, no two are alike. Also noted are H. memmingeri, named for Edward Read Memminger, and supposedly similar to H. virginica but with a more rounded leaf and smaller calyx (the outer part of the floral structure), H. heterophyllum (heterophyllum means diverse-leafed) which can be found in five Western counties and H. shuttleworthii named for Robert James Shuttleworth 1810-1874, which is much larger than any of the others and has been seen at only four stations in West Virginia. It's more common in the mountains of the Carolinas and down through Georgia and Alabama. Fred Galle of Callaway Gardens in Georgia discovered a particularly beautiful variegated plant and named it 'Callaway'. I have seen leaves of H. shuttleworthii approaching 6" long. 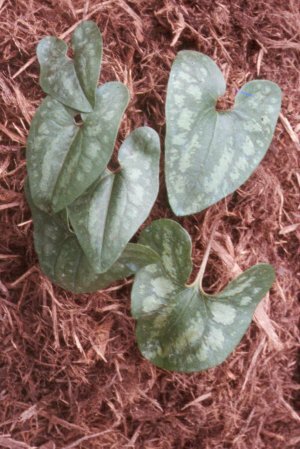 There are several other Asarum and Hexastylis species in the U S, another more Southern species is H. arifolium, native from Southern Virginia down through Florida and West to Alabama, the specific epithet refers to the arrow shaped leaves which are evergreen and can be up to 20 cm ( 5" ) long. On the West Coast there are two species, both considered evergreen so that would put them into the genus Hexastylis, H. caudatum which grows from British Columbia to California and H. hartwegii said to grow in Oregon and California. 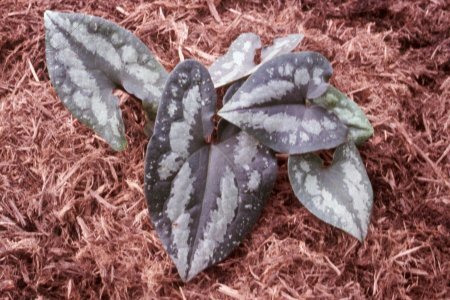 I also grow some of the Asian species such as H. splendens, which has the most silvery markings of any plant that I have seen, on huge arrow shaped leaves. In Japan people fanatically collect these plants. There are several societies and many exhibitions. One of my Japanese trading partners recently send me two books, each with over 400 color photos of cultivated Asarum and Hexastylis. One book focused on the various leaf types and the other on the bizarre flowers. 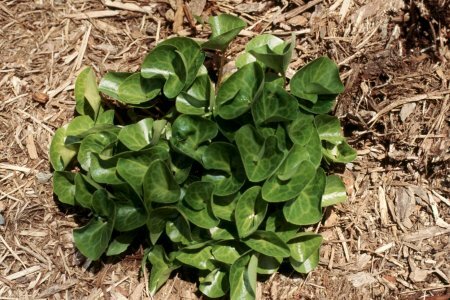 In the garden these plants, Asarum canadense in particular, make great ground covers for the shade. If conditions are favorable they spread quickly and vigorously. I use them under trees and in the front of taller plants. If they get too much sun they will burn a little, so the more shade, the better. In cultivation they usually get 8"-12" tall. Plants can be divided in the Early Spring by slicing the thick rhizome which grows very close to the soil level, sometimes exposed. You can also collect the seeds which ripen in mid-late Summer. Sow them on the surface of 4" pots and cover with a layer of granite grit. Place the pots outside for the winter and the seeds will germinate the following Spring. Another well known species is Asarum europaeum or what should, because of its evergreen nature, should be called Hexastylis europaea. Its been called Asarum for so long that it will probably hold on to that name for generations. This is a very fast growing plant and a prolific self seeder. It seems to handle more sun than most other Gingers. As briefly mentioned earlier, another genus in the Aristolochiacea family is Aristolochia. We have two species in these mountains, A. macrophylla, ( named for its large leaves ) formerly known as A. durior, and A. serpentaria ( named for its reputed value in curing snakebites ). A. macrophylla is common in rich moist woods throughout the state. The common name, Dutchmans Pipe Vine refers to the unusually shaped curved flowers that resemble a Dutch Pipe. The leaves on this vining plant are very large, I've seen them approaching 20cm-25cm ( up to 12" ). The vine can climb 5m- 10m (15'-30') up a tree. They make a great addition to the garden where you have a porch or trellis to cover. If you look in the woods, you can find old vines that are 3cm-6cm ( 1"-2" ) thick and perfectly coiled around tree branches. The other species, A. serpentaria, which grows from 12 cm to 45 cm ( 4" to 18" ) tall has oblong leaves, cordate at the base that are 4 cm to 12 cm ( 1.5" to 5" ) long. It has a history of use as a bitter tonic since pioneer times. The key to successful gardening with native plants is to replicate the growing conditions found in their natural habitat. I hope that everyone gets a chance to enjoy these plants both in the wild, and in their gardens.